You can view and export time and job reports from the Time Edit/Report feature. 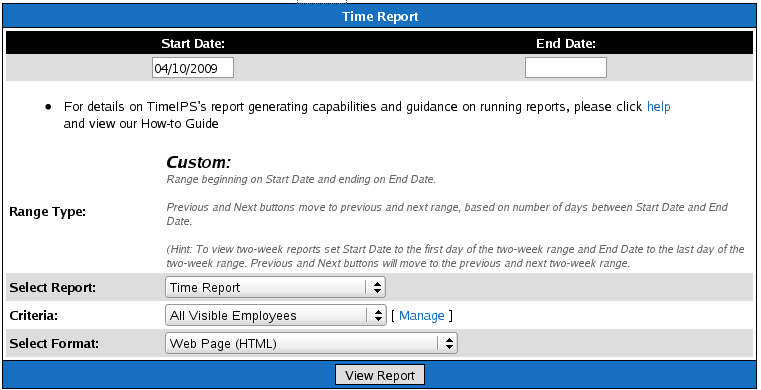 You can also edit an employee's time when viewing the time report through TimeIPS. Several reports are available in the Select Report pull-down. Time Reports list employees' time worked. Summary reports graphically display time worked on specific jobs, and the Volt e-Time compatible report exports time worked data into the Volt program. Using the Criteria pull-down, you can view Time Reports by groups of employees such as All Employees Managed By Me, All Employees, All Hourly Employees, or All Salaried Employees. You can also view employees by Type. Employees with only login access do not have rights to view time reports from this area. Managers have rights to view only their employee's time reports. The Select Format pull-down allows you to view time reports in a Web Page (HTML) or export the information into a Spreadsheet program (CSV).